I decided to join the Daring Bakers, started by Lis of La Mia Cucina and Ivonne of Cream Puffs in Venice, who in November 2006 decided to try baking the same recipe and writing about it. Gradually, it grew into a sizeable baking group that currently has more than 700 members dedicated to baking something daring each month. This month was truly daring‑Opéra Cake. A multi-layered cake of delicious cake, syrup, mousse, and ganache that requires perfection and patience (both of which I need to work on!). Its undecorated sides show all the layers, and all the imperfections that I usually rely on icing to hide! Thanks to the hosts for this month’s Daring Bakers event: Lis of La Mia Cucina, Ivonne of Cream Puffs in Venice, Fran of Apples Peaches Pumpkin Pie, and Shea of the blog Whiskful. According to Food Timeline, Opéra Cake is a modern, 20th century cake with ancient roots. A typical Opéra Cake consists of an almond sponge cake with a coffee and chocolate filling and icing. In this version, the Daring Bakers put a “light” (color not calories) twist on it for Spring and dedicated it to all the hard work that Barbara of winosandfoodies.com has done for the food blog event called A Taste of Yellow. This event supports the LiveSTRONG foundation started by Lance Armstrong. You can check out all the entries for this amazing event at her blog. Here’s the link to LiveSTRONG With A Taste Of Yellow Round Up 2008 Part 1 (180 bloggers contributed posts for this event!). Check out Part 2 as well when you're there. This is a long recipe with 5 parts, but each component is not hard. And, the good thing is you can do 4 of the 5 parts ahead of time. To see the different Opéra Cakes cropping up all over the food blog world, check out the Daring Bakers Blogroll. The cake part of Opéra Cake is made up of a sponge cake called a joconde, named for the Mona Lisa (La Joconde in French). Some spell joconde as “jaconde”, but joconde is the proper way to spell it. The married name of Lisa Gherardini, who is believed to be the subject of da Vinci's portrait, is Giocondo, which means cheerful and full of good humor in Italian, as does “jocund” in English. Perhaps it's the lightness of the sponge cake that gives joconde its name. In another bowl of a stand mixer fitted with the paddle attachment (or using a handheld mixer), beat the almond flour (or chestnut flour), icing sugar, and eggs on medium speed until light and voluminous, about 3 minutes. 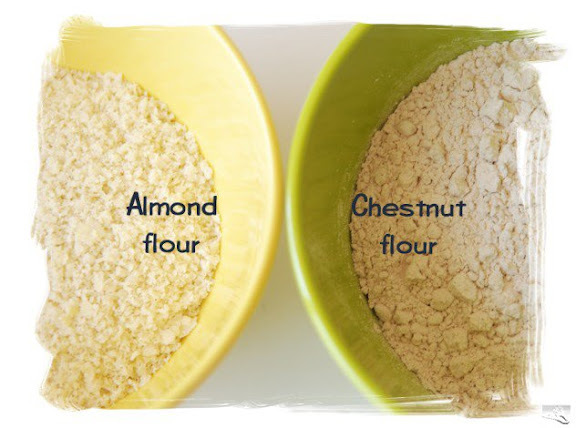 To make almond flour, you mix 50% ground almonds with 50% icing sugar. This is called "Tant pour Tant" ("that much for that much"). You can do this with chestnuts too, but I was able to find both almond and chestnut flour at a specialty grocery store. 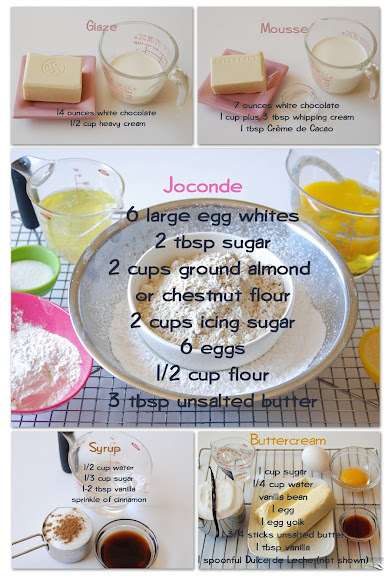 I tried joconde twice: once with almond flour and once with chestnut flour. Although both sponge cakes were delicious, the almond played a better supporting role for the other layers. Add the all-purpose flour and beat on low speed until the flour is just combined (be very careful not to overmix here!). Using a rubber spatula, gently fold the meringue into the almond mixture and then fold in the melted butter. Divide the batter between the pans and spread it evenly to cover the entire surface of each pan. A tip I read was to run your thumb against all sides of the pan to prevent over-baking at the edges. Place one jelly-roll pan in the middle of the oven and the second jelly-roll pan in the bottom third of the oven. Bake the cake layers until they are lightly browned and just springy to the touch. This could take anywhere from 5 to 9 minutes depending on your oven. Do not over-bake. It should only take a little color. Note: The joconde can be made up to 1 day in advance and kept wrapped at room temperature. Stir all the syrup ingredients together in the saucepan and bring to a boil. Remove from the heat and let cool to room temperature. Note: The syrup can be made up to 1 week in advance and kept covered in the refrigerator. Continue to cook, without stirring, until the syrup reaches 225˚F (107˚C) on a candy or instant-read thermometer. Once it reaches that temperature, remove the syrup from the heat. According to Joe Pastry, the baking guru I like to consult, “eggs must be warm before you begin. Why? The answer is that a cake batter is an emulsion, which is to say, a matrix of tiny fat blobs dispersed in a watery medium. That emulsion plays a critical role in leavening the cake, and in maintaining its soft, creamy texture.” So, warm those eggs before starting this buttercream. At this point add in your flavoring and beat for an additional minute or so. Note: The buttercream can be made up to 1 month in advance and packed in an airtight container. If made way in advance, you can freeze the buttercream. Alternatively you can refrigerate it for up to 4 days after making it. To use the buttercream, simply bring it to room temperature and then beat it briefly to restore its consistency, if needed. Melt the white chocolate and the 3 tablespoons of heavy cream in a small saucepan. Stir to ensure that it’s smooth and that the chocolate is melted. Add the tablespoon of liqueur to the chocolate and stir. Set aside to cool completely. In the bowl of a stand mixer, whip the remaining 1 cup of heavy cream until soft peaks form. Gently fold the whipped cream into the cooled chocolate to form a mousse. If it’s too thin, refrigerate it for a bit until it’s spreadable. If you’re not going to use it right away, refrigerate until you’re ready to use. Note: The mousse can be made ahead and refrigerated until you’re ready to use it. Note: Make the glaze when you’re ready to finish the cake. Melt the white chocolate with the heavy cream. Whisk the mixture gently until smooth. Let cool for 10 minutes and then spread over the chilled cake. Using a long metal cake spatula, smooth out into an even layer. Note: The finished cake should be served slightly chilled. It can be kept in the refrigerator for up to 1 day (but I stored it for more than a week, and we still enjoyed every crumb!). Place one square of cake on the baking sheet and moisten it gently with the flavored syrup. Prepare the mousse (if you haven’t already) and then spread it on the top of the last layer of the joconde. Refrigerate for at least two to three hours to give the mousse the opportunity to firm up. Make the glaze and after it has cooled, spread it over the top of the chilled cake. Refrigerate the cake again to set the glaze. We enjoyed both the almond and chestnut Opéra Cakes, but preferred the almond one just slightly. One of my daughters even wanted this for her birthday cake! Each part was delicious: the syrup, the sponge cake, the buttercream, the mousse, and the ganache. So together, how could it go wrong? I kept stealing tastes as I was assembling it. I think one of the tricks to making a perfect layer cake is to put a ton of buttercream in-between each layer, which might level it out better. I’m going to have to make this over and over again to improve my layering skills, but I don’t think anyone will mind! I’m looking forward to seeing the variety of Opéra Cakes from the Daring Bakers this month! your cakes look wonderful! Great job! Welcome to the group! Wow-Cakes and Buns! They look so very delicious. You've been busy. I just joined DYB for next month too. It's so fun to bake in groups. Thanks for stopping by my blog! Your cakes look great! Welcome to the DBs! Your cake looks great! Well done! Wow, what a great write up. And photographs. And cake. It's all just amazing. i really like that you put the ingredients on the pictures, it's a good use of space! First, welcome to the DBs. Second, I love, love, love...in case I wasn't clear, LOVE your pictures and descriptions. Third, Your presentations are stunning and you've given me lots of ideas for the restaurant. :) Have a great week! oh shari those cakes look AMAZING!!!! i love the one with the big pink flower, you are such a maven!! btw i didn't know that the KA mixer has an overload reset button!! where is it? i need to try that first. Your cups are so nice a perfect gallery for your lovely cakes. Beautiful cakes! Welcome to DB! Your cakes look wonderful! The flowers give them such a lovely touch! They look awesome and I love reading your posts- so much good information and such beautiful presentation. Great job! Your presentation with the tea cups is so cute and very unique! Nice job!!! 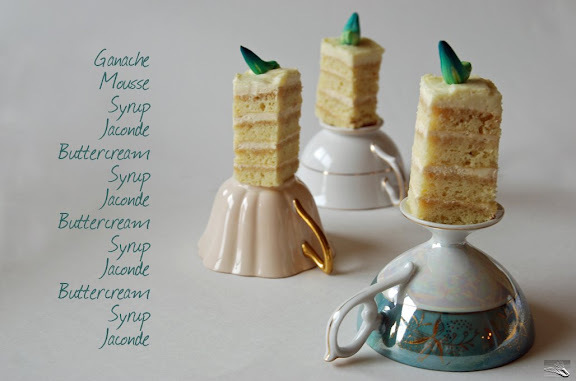 Love the slivers of Opéra cake on upside-down tea cups...it's a lovely image! I was pulling my hair out at certain points, but I love, love, loved the results! your baking skills and detailed posts are a wonderful addition to the DB group! and i think you must have infinite patience to produce such fantastic variations of every recipe you try. your operas look wonderful, and i love that they are able to balance themselves on the bottoms of teacups! wow! You are very talented. they look gorgeous! Your cakes are soo beautiful, I love how creative you are and your pictures are amazing. Great job! Your cakes are simply beautiful! Wish mine had turned out as nice. Fantastic job, love the write up and the pictures. Amazing to read a good recipe well executed, so detail explain so do the pictures. I love that you experimented with different flours! Great job on your first challenge! Absolutely gorgeous! Fabulous photos too! you always have the most gorgeous photos! I adore your ingredients layout er mise en place. Your cakes are just beautiful! I really love the photos. Great job! I absolutely love it that you decorated them with flowers! So beautiful! Very nice! Love your creativity with the teacups! your cakes look lovely! i love your pictures! They look great and I love the tea cup plating. Very nice work! looks so beautiful with the flowers and the flavors sound so good! I love your post - the beautiful pictures and the great links to more beautiful pictures! Thanks for sharing. Your Opera cake looks so pretty and so yummy! Great job! What beautiful opera cakes! I love your photos with the ingredients listed... looks like it should go in a cookbook! Thanks for stopping by my blog as well. Yay for completing our first DB challenge! Can't wait for June! your opera looks great, you don't have to complex ! Honestly, I don't see how you could think that your cake is anything less than perfect- It's really gorgeous! I like how you cut yours into dainty little portions too. You did a wonderful job on your cake. I love your pictures of the cakes on the tea cups. Congratulations on finishing your first challenge. Welcome to the Daring Bakers! Your photos are beautiful. I'm excited to see what DB gives us for June...Thanks for stopping by my blog! Wow, your comment section is all fritzy right now! How cool that you tried chestnut. Very creative. Nice to know there's another finger licker out there in DB land, too. ;) Very lovely display of your work here. Impressive. Not only your cake is gorgeous but your post is so beautiful, we can see how much care you've put into it. Great job! Welcome and congrats on you very first challenge! Your cakes look very pretty! Great job here! Congratulations on your first DB challenge! Your cakes are so cute and I love the pictures of them on the tea cups! WOW, i love all the variations in shapes you did! beautiful! these are so cute....can I have a bite??? these cakes look unbelievably fantastic! encore! encore! This was your first challenge? Incredible! I love the upside-down teacups. :) Lovely, simply smashing! The set up on your images is great! I love it! BEAUTIFUL! I love your imaginative way of photographing them, too. The flowers are a great touch. They look so perfect! I like the idea of making them round and small, very dainty! Superb! You really did a great job. How lucky your daughter is to have you as her personal baker. It's the best when you can bake to order for you family. Great photos & write-up. Welcome to DB! What a delicious write-up. Makes me want to bake it all over again. Lovely photos and I especially like the flowers. I'm impressed that you made both almond and chestnut versions. Glad you are a daring baker! Your opera cakes look so good! And welcome to the DBs! I love your description of the "Jaconde". My gf is a french teacher and she told me the same thing, how interesting! Your cakes of course are beautiful, well done! Your blog is so pretty and calming; I love it. Those cakes are definitely opera rather than music hall - so elegant. Your cake has already achieved perfection! Your photos are beyond beautiful! Thank you so much for visiting my blog and leaving a comment. It helped me find your blog:) I like it here and I subscribed to you to be updated on your yummie yums! I have had a great time looking at all you daring baker's opera cakes. But yours!!!! Oh, my goodness...they are my favorite. They look like gorgeous, oversized petit fours (and i mean that as the biggest of compliments!) Your teacups are darling, too. Love, love love. Wow! Your opera cake tops mine by a mile. You are quite the talented baker, I must say :) Way to go and yay for Daring Bakers! Wow your cake looks beautiful!! I especially love the photo of the pieces of cake on upside down tea cups. what a piece of art you´ve got there!!! I´m impressed with your talent!!! COngratulations!! YOur Opera Cake is marvelous!!! wow! I love your blog! good job on the opera cake too! Your presentation of everything is lovely. Great job. Lovely photography and great cakes! Your cakes looks really lovely! All I can say is wow! Those are some pretty little cakes! Your cakes look simply lovely! Your cake looks awesome!!! you did a great job with this challenge! Wow, quite impressive for a first challenge! Your cakes are beautiful! And thank you for your comment on my blog, it is greatly appreciated. your cakes are lovely. 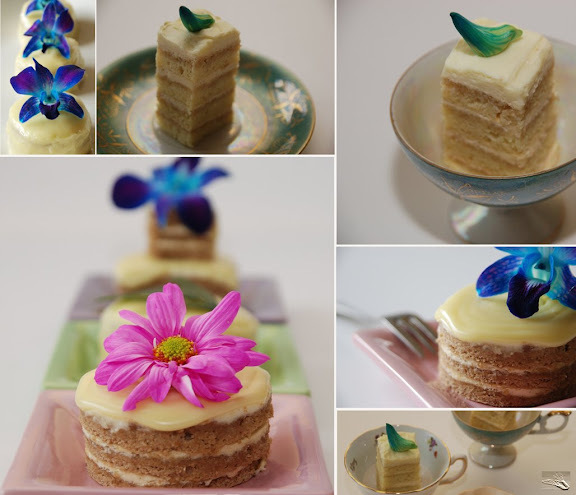 i love your photos, especially the ones of the opera cake on teacups :). Nice cakes and photos. Love your site too. Welcome to the DB's. I'm overwhelmed with everyone's nice comments. It's going to be fun and challenging to be part of this amazing DB group! Thanks to everyone for stopping by!